Take a scenic ride on the Panorama Gondola, departing from the Adventure Center. Panorama is Mammoth's eight-passenger state-of-the-art gondola, whisking passengers to Mammoth's 11,053-foot summit. The ride is quick and quiet with stunning views of the Eastern Sierra. Once at Panorama Station, guests are welcome to view the Sierra from the enclosed building or wander outside to explore one of the many hiking trails, or just have a look around and appreciate views of the majestic Minarets, Reds Meadow and Twin Lakes. Scenic gondola rides are offered daily from 9:00 a.m. to 5:00 p.m., wind and weather permitting. For more family fun, visit the climbing rock located on the lawn of Mammoth Mountain Inn. Climbers of all ages and abilities scale the massive 32' high granite-like boulder, learning new skills and improving technique. The staff teaches belaying and supervises the program. Mammoth High Adventures' map and compass course and their Challenge Ropes Course (for groups of 10 or more) is also available at the Adventure Center. Through a "challenge-by-choice" philosophy, risk taking increases as confidence within the group does. High elements (30' - 60') to choose from include jumping for the trapeze from "The Perch," or riding down the 450' long Zip Line. Being "on belay" makes the actual risk factor very low - it's the perceived risk that makes this experience so unforgettable. To gain a greater perspective of the beauty of the area, hop on the shuttle to Reds Meadow for a spectacular ride along the San Joaquin River. There are ten stops along the way providing access to walking and hiking trails to some of the area's most popular scenic wonders - Devils Postpile National Monument and Rainbow Falls. 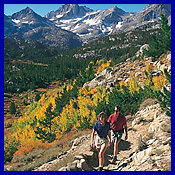 The Ansel Adams and John Muir Wilderness Areas serve as an enduring and wondrous backdrop for day or weeklong trips. The shuttle boards in front of the Yodler throughout the day with the last bus leaving Reds Meadow Resort at 6:15 p.m.
After taking in the sights and sounds from Mammoth Mountain and Reds Meadow, come back down to earth at the Yodler or Mountainside Grill and enjoy a meal or beverage on one of the outside decks and revel in the beauty of Mammoth Lakes. For more information or to purchase tickets, visit the website at www.mammothmountain.com or call 800-MAMMOTH.